California Chrome at Belmont Park on Wednesday in Elmont, New York. On Saturday, California Chrome became the 34th horse to win the Preakness Stakes and Kentucky Derby, and thus the 34th horse with a chance to complete the Triple Crown at the Belmont Stakes, to be held June 7. Of the 33 previous horses that had such an opportunity, 11 succeeded — from Sir Barton in 1919 to Affirmed in 1978. The last 12 horses to win the Derby and the Preakness have failed to complete the Triple Crown, which has a historical success rate of 33 percent. The current slump is unlikely: The odds of it happening by chance are about 1 in 130 — nearly the same as the 2011 Atlanta Braves failing to make Major League Baseball’s playoffs with 18 games remaining and an 8.5-game lead for the wild card. But the 12 races in question aren’t the only Triple Crown attempts to fall short: They’re the only ones we knew about at the time. What if time weren’t a constraint? In order, the Triple Crown races go, the Kentucky Derby, Preakness Stakes and Belmont Stakes. Let’s ignore order. Since 1979, there have been five horses that won the Preakness and Belmont but came up short in the Derby — let’s call these failed “reverse” attempts. There have been two horses that won the Derby and the Belmont but not the Preakness — let’s call these failed “gutshot” attempts. (All seven horses ran in all three events.) This brings our total failed Triple Crown attempts since 1979 to 19. Between 1919 and 1978, horses actually converted atemporal Triple Crown attempts at a higher rate than temporal ones, winning their “final” leg in 55 percent of opportunities (33/60) versus 52 percent in the Belmont alone. Note that I used a logarithmic scale on the y-axis, so each gridline represents the event being 10 times less likely than the gridline below. From this perspective, the atemporal Triple Crown slump looks spectacular. If you think those figures seem ridiculous, let’s look at the odds posted by the favorites at the Belmont each year. The odds of all 11 horses that raced in the Belmont losing at their race odds (by chance) are only 1 in 20,000 — about the odds of a random pitcher throwing a perfect game on a given night (and that’s not counting I’ll Have Another, who in 2012 was 4:5 to win but scratched on race day). Although historically comparable pari-mutuel odds won’t be available until the Wednesday before the Belmont, various online/offshore futures markets list California Chrome at close to even money. This seems high relative to the overall Belmont conversion rate of 33 percent (much less the dismal rate in recent years), but there’s good news for California Chrome in our analysis as well. 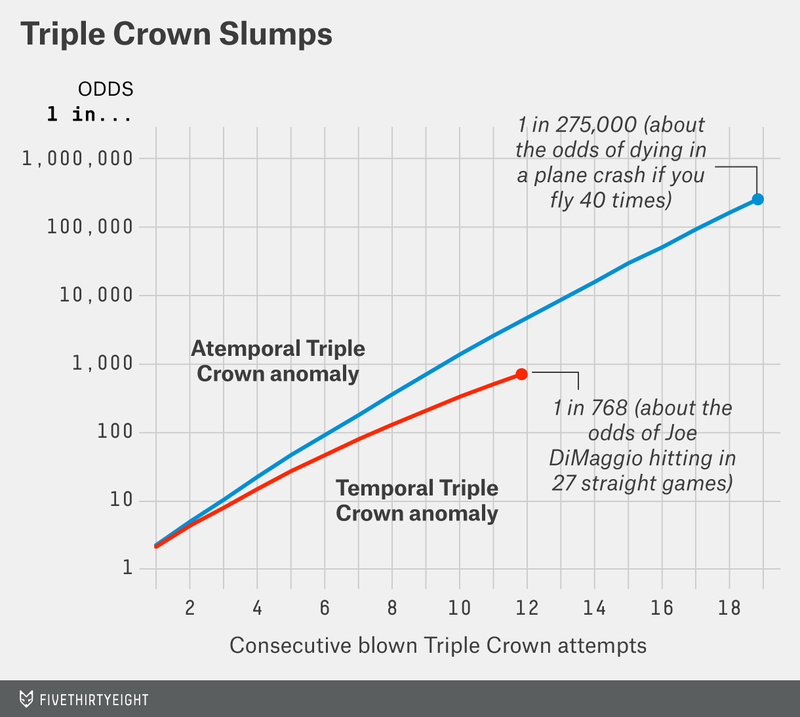 Factoring in atemporal Triple Crown attempts significantly increases the chances that the present slump has a legitimate cause, but it also mitigates the slump’s impact on the historical record. Including our 19 failed attempts since 1979, horses have converted 42 percent (33 of 79) of such opportunities.